Describe the action of a capacitor and define capacitance. Explain parallel plate capacitors and their capacitances. Discuss the process of increasing the capacitance of a dielectric. Determine capacitance given charge and voltage. A capacitor is a device used to store electric charge. Capacitors have applications ranging from filtering static out of radio reception to energy storage in heart defibrillators. Typically, commercial capacitors have two conducting parts close to one another, but not touching, such as those in Figure 1. 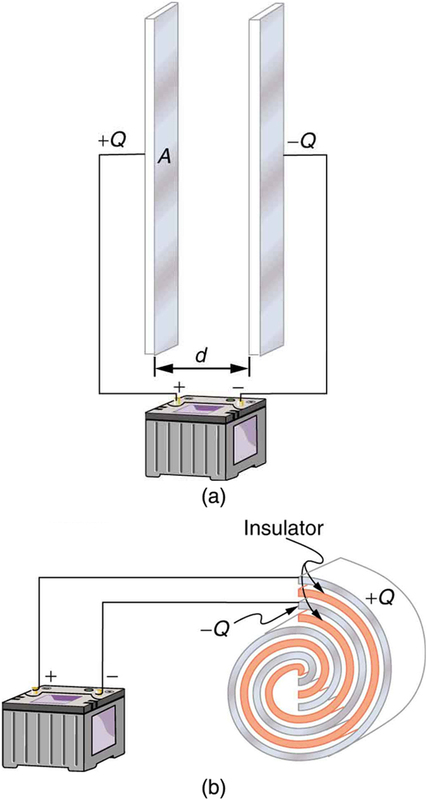 (Most of the time an insulator is used between the two plates to provide separation—see the discussion on dielectrics below.) When battery terminals are connected to an initially uncharged capacitor, equal amounts of positive and negative charge, and , are separated into its two plates. The capacitor remains neutral overall, but we refer to it as storing a charge in this circumstance. A capacitor is a device used to store electric charge. Figure 1. Both capacitors shown here were initially uncharged before being connected to a battery. They now have separated charges of +Q and –Q on their two halves. (a) A parallel plate capacitor. (b) A rolled capacitor with an insulating material between its two conducting sheets. The amount of charge a capacitor can store depends on two major factors—the voltage applied and the capacitor’s physical characteristics, such as its size. Figure 2. Electric field lines in this parallel plate capacitor, as always, start on positive charges and end on negative charges. Since the electric field strength is proportional to the density of field lines, it is also proportional to the amount of charge on the capacitor. This is true in general: The greater the voltage applied to any capacitor, the greater the charge stored in it. A 1-farad capacitor would be able to store 1 coulomb (a very large amount of charge) with the application of only 1 volt. One farad is, thus, a very large capacitance. Typical capacitors range from fractions of a picofarad to millifarads . Figure 3 shows some common capacitors. 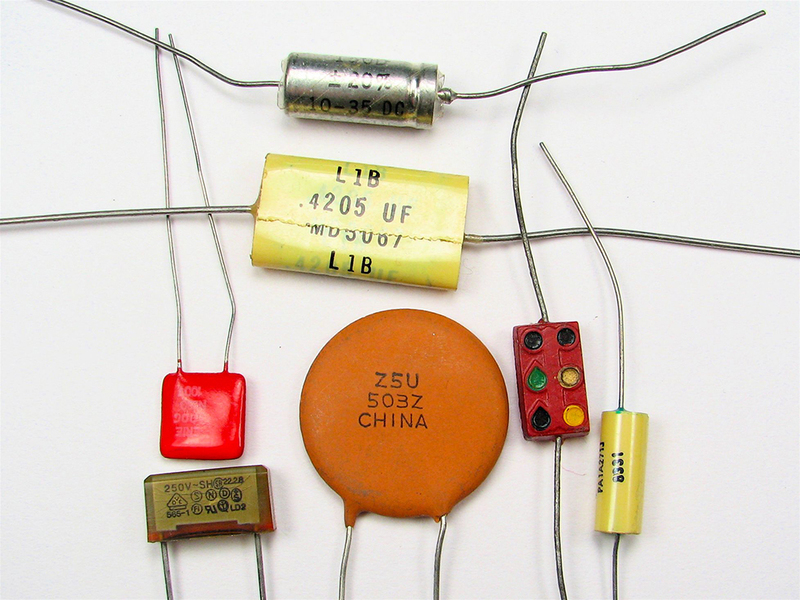 Capacitors are primarily made of ceramic, glass, or plastic, depending upon purpose and size. Insulating materials, called dielectrics, are commonly used in their construction, as discussed below. The parallel plate capacitor shown in Figure 4 has two identical conducting plates, each having a surface area , separated by a distance (with no material between the plates). When a voltage is applied to the capacitor, it stores a charge , as shown. We can see how its capacitance depends on and by considering the characteristics of the Coulomb force. We know that like charges repel, unlike charges attract, and the force between charges decreases with distance. So it seems quite reasonable that the bigger the plates are, the more charge they can store—because the charges can spread out more. Thus should be greater for larger . Similarly, the closer the plates are together, the greater the attraction of the opposite charges on them. So should be greater for smaller . Figure 4. Parallel plate capacitor with plates separated by a distance d. Each plate has an area A. (a) What is the capacitance of a parallel plate capacitor with metal plates, each of area , separated by 1.00 mm? (b) What charge is stored in this capacitor if a voltage of is applied to it? Finding the capacitance is a straightforward application of the equation . Once is found, the charge stored can be found using the equation . This small value for the capacitance indicates how difficult it is to make a device with a large capacitance. Special techniques help, such as using very large area thin foils placed close together. This charge is only slightly greater than those found in typical static electricity. Since air breaks down at about , more charge cannot be stored on this capacitor by increasing the voltage. This electric field is enough to cause a breakdown in air. The previous example highlights the difficulty of storing a large amount of charge in capacitors. If is made smaller to produce a larger capacitance, then the maximum voltage must be reduced proportionally to avoid breakdown (since ). An important solution to this difficulty is to put an insulating material, called a dielectric, between the plates of a capacitor and allow to be as small as possible. Not only does the smaller make the capacitance greater, but many insulators can withstand greater electric fields than air before breaking down. Values of the dielectric constant for various materials are given in Table 1. Note that for vacuum is exactly 1, and so the above equation is valid in that case, too. If a dielectric is used, perhaps by placing Teflon between the plates of the capacitor in Example 1, then the capacitance is greater by the factor , which for Teflon is 2.1. How large a capacitor can you make using a chewing gum wrapper? The plates will be the aluminum foil, and the separation (dielectric) in between will be the paper. This is 42 times the charge of the same air-filled capacitor. The maximum electric field strength above which an insulating material begins to break down and conduct is called its dielectric strength. Microscopically, how does a dielectric increase capacitance? Polarization of the insulator is responsible. The more easily it is polarized, the greater its dielectric constant . Water, for example, is a polar molecule because one end of the molecule has a slight positive charge and the other end has a slight negative charge. The polarity of water causes it to have a relatively large dielectric constant of 80. The effect of polarization can be best explained in terms of the characteristics of the Coulomb force. 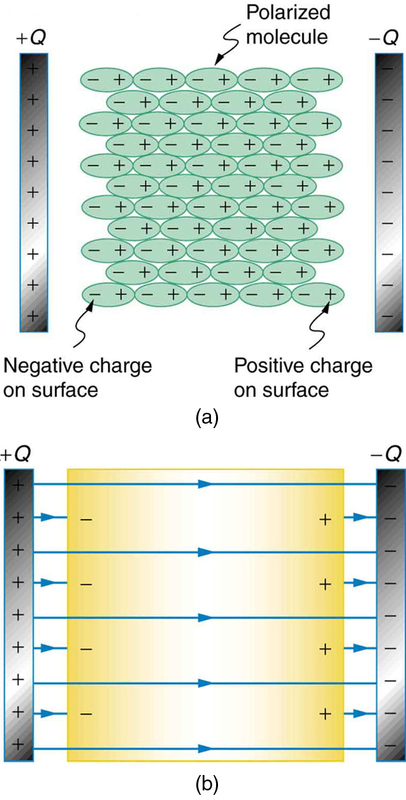 Figure 5 shows the separation of charge schematically in the molecules of a dielectric material placed between the charged plates of a capacitor. The Coulomb force between the closest ends of the molecules and the charge on the plates is attractive and very strong, since they are very close together. This attracts more charge onto the plates than if the space were empty and the opposite charges were a distance away. Figure 5. (a) The molecules in the insulating material between the plates of a capacitor are polarized by the charged plates. This produces a layer of opposite charge on the surface of the dielectric that attracts more charge onto the plate, increasing its capacitance. (b) The dielectric reduces the electric field strength inside the capacitor, resulting in a smaller voltage between the plates for the same charge. The capacitor stores the same charge for a smaller voltage, implying that it has a larger capacitance because of the dielectric. Another way to understand how a dielectric increases capacitance is to consider its effect on the electric field inside the capacitor. Figure 5(b) shows the electric field lines with a dielectric in place. Since the field lines end on charges in the dielectric, there are fewer of them going from one side of the capacitor to the other. So the electric field strength is less than if there were a vacuum between the plates, even though the same charge is on the plates. 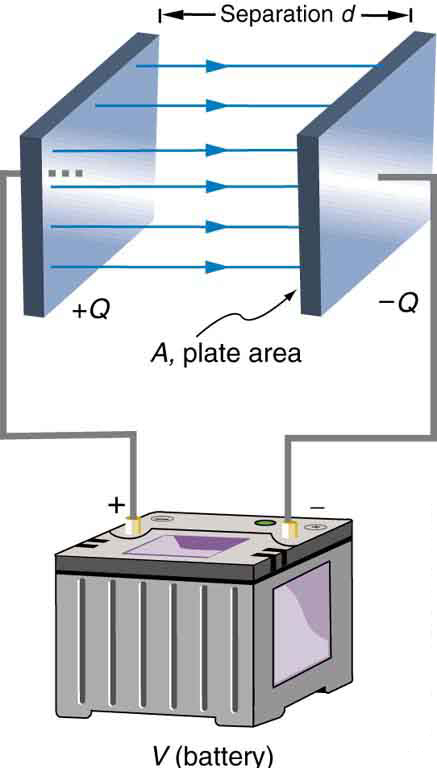 The voltage between the plates is , so it too is reduced by the dielectric. Thus there is a smaller voltage for the same charge ; since , the capacitance is greater. The dielectric constant is generally defined to be , or the ratio of the electric field in a vacuum to that in the dielectric material, and is intimately related to the polarizability of the material. 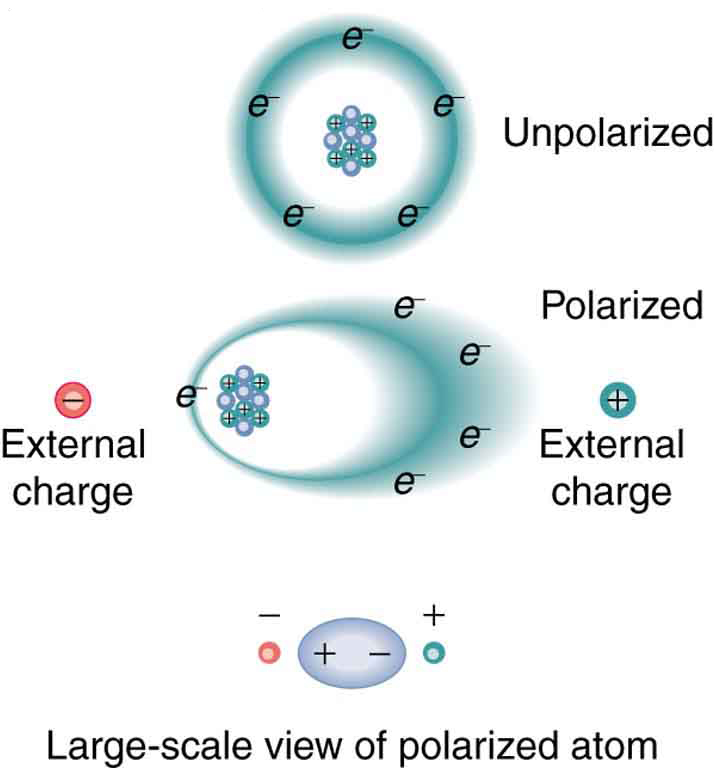 Polarization is a separation of charge within an atom or molecule. As has been noted, the planetary model of the atom pictures it as having a positive nucleus orbited by negative electrons, analogous to the planets orbiting the Sun. Although this model is not completely accurate, it is very helpful in explaining a vast range of phenomena and will be refined elsewhere, such as in Chapter 30 Atomic Physics. The submicroscopic origin of polarization can be modeled as shown in Figure 6. Figure 6. Artist’s conception of a polarized atom. The orbits of electrons around the nucleus are shifted slightly by the external charges (shown exaggerated). The resulting separation of charge within the atom means that it is polarized. 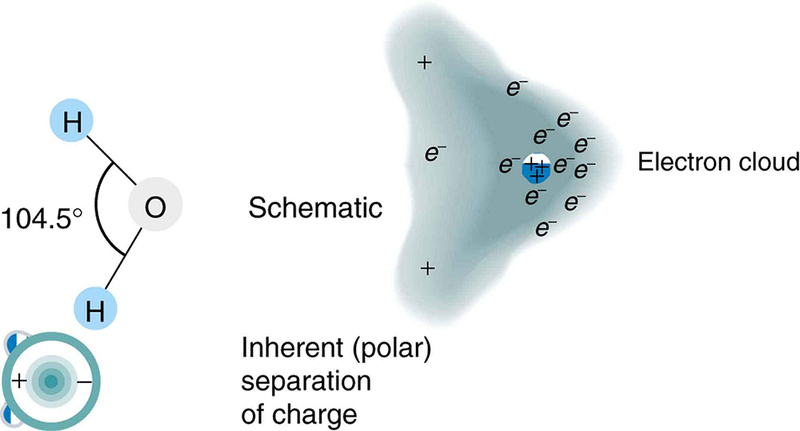 Note that the unlike charge is now closer to the external charges, causing the polarization. We will find in Chapter 30 Atomic Physics that the orbits of electrons are more properly viewed as electron clouds with the density of the cloud related to the probability of finding an electron in that location (as opposed to the definite locations and paths of planets in their orbits around the Sun). This cloud is shifted by the Coulomb force so that the atom on average has a separation of charge. Although the atom remains neutral, it can now be the source of a Coulomb force, since a charge brought near the atom will be closer to one type of charge than the other. Some molecules, such as those of water, have an inherent separation of charge and are thus called polar molecules. Figure 7 illustrates the separation of charge in a water molecule, which has two hydrogen atoms and one oxygen atom . The water molecule is not symmetric—the hydrogen atoms are repelled to one side, giving the molecule a boomerang shape. The electrons in a water molecule are more concentrated around the more highly charged oxygen nucleus than around the hydrogen nuclei. This makes the oxygen end of the molecule slightly negative and leaves the hydrogen ends slightly positive. The inherent separation of charge in polar molecules makes it easier to align them with external fields and charges. Polar molecules therefore exhibit greater polarization effects and have greater dielectric constants. Those who study chemistry will find that the polar nature of water has many effects. For example, water molecules gather ions much more effectively because they have an electric field and a separation of charge to attract charges of both signs. Also, as brought out in the previous chapter, polar water provides a shield or screening of the electric fields in the highly charged molecules of interest in biological systems. Explore how a capacitor works! Change the size of the plates and add a dielectric to see the effect on capacitance. Change the voltage and see charges built up on the plates. Observe the electric field in the capacitor. Measure the voltage and the electric field. A capacitor is a device used to store charge. The capacitance of a parallel plate capacitor is , when the plates are separated by air or free space. is called the permittivity of free space. where is the dielectric constant of the material. The maximum electric field strength above which an insulating material begins to break down and conduct is called dielectric strength. 1: Does the capacitance of a device depend on the applied voltage? What about the charge stored in it? 2: Use the characteristics of the Coulomb force to explain why capacitance should be proportional to the plate area of a capacitor. Similarly, explain why capacitance should be inversely proportional to the separation between plates. 5: Sparks will occur between the plates of an air-filled capacitor at lower voltage when the air is humid than when dry. Explain why, considering the polar character of water molecules. 6: Water has a large dielectric constant, but it is rarely used in capacitors. Explain why. 7: Membranes in living cells, including those in humans, are characterized by a separation of charge across the membrane. Effectively, the membranes are thus charged capacitors with important functions related to the potential difference across the membrane. Is energy required to separate these charges in living membranes and, if so, is its source the metabolization of food energy or some other source? Figure 9. The semipermeable membrane of a cell has different concentrations of ions inside and out. 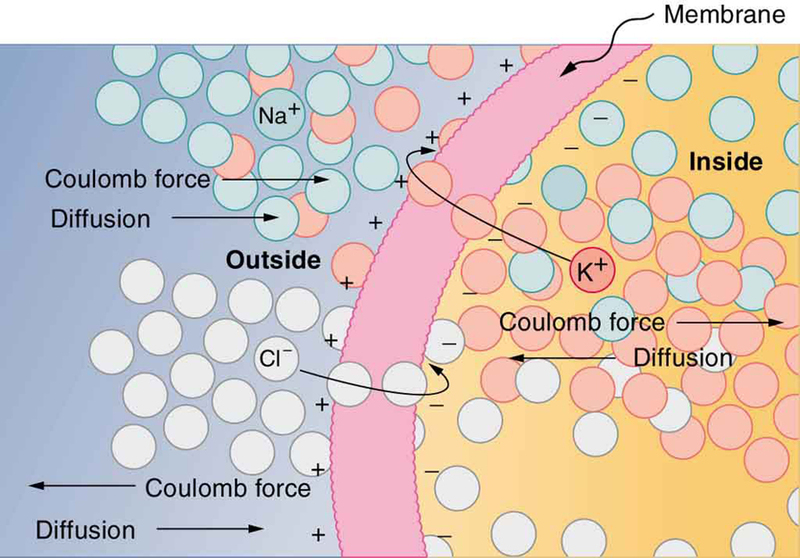 Diffusion moves the K+ (potassium) and Cl– (chloride) ions in the directions shown, until the Coulomb force halts further transfer. This results in a layer of positive charge on the outside, a layer of negative charge on the inside, and thus a voltage across the cell membrane. The membrane is normally impermeable to Na+ (sodium ions). 1: What charge is stored in a capacitor when 120 V is applied to it? 2: Find the charge stored when 5.50 V is applied to an 8.00 pF capacitor. 3: What charge is stored in the capacitor in Example 1? 4: Calculate the voltage applied to a capacitor when it holds of charge. 5: What voltage must be applied to an 8.00 nF capacitor to store 0.160 mC of charge? 6: What capacitance is needed to store of charge at a voltage of 120 V? 7: What is the capacitance of a large Van de Graaff generator’s terminal, given that it stores 8.00 mC of charge at a voltage of 12.0 MV? 8: Find the capacitance of a parallel plate capacitor having plates of area that are separated by 0.100 mm of Teflon. 9: (a)What is the capacitance of a parallel plate capacitor having plates of area that are separated by 0.0200 mm of neoprene rubber? (b) What charge does it hold when 9.00 V is applied to it? A prankster applies 450 V to an capacitor and then tosses it to an unsuspecting victim. The victim’s finger is burned by the discharge of the capacitor through 0.200 g of flesh. What is the temperature increase of the flesh? Is it reasonable to assume no phase change? (a) A certain parallel plate capacitor has plates of area , separated by 0.0100 mm of nylon, and stores 0.170 C of charge. What is the applied voltage? (b) What is unreasonable about this result? (c) Which assumptions are responsible or inconsistent? (b) The voltage is unreasonably large, more than 100 times the breakdown voltage of nylon. (c) The assumed charge is unreasonably large and cannot be stored in a capacitor of these dimensions. 19.5 Capacitors and Dielectrics by OpenStax is licensed under a Creative Commons Attribution 4.0 International License, except where otherwise noted.